When our school began, West Hall stood alone high on the Bluff. By agreement between the founders Archbishop Alexander Christie and Fr. John Zahm, C.S.C., a condition for passing ownership and control of the University from the Archdiocese to the Congregation of Holy Cross was the construction of a significant, permanent building on the campus grounds within ten years of the transfer of title. In 1911, Christie Hall became the second brick-and-stone building on the Bluff (named as thank-you for the Archbishop’s unstinting support of the school and students). This 1927 plan never happened, at least not along those lines. West, renamed as Waldschmidt Hall, is still in use today. 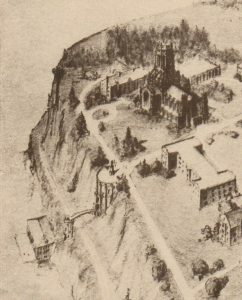 Yet further growth and expansion was not long delayed, with Science Hall dedicated and open for instruction in 1937. 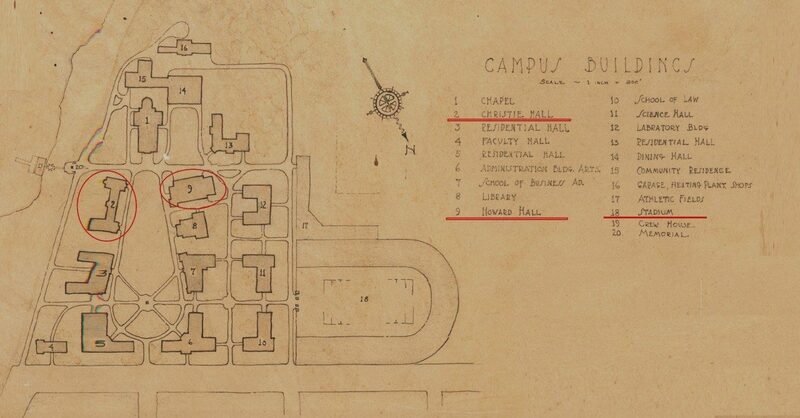 Plotting the location for Science Hall meant rethinking the campus plan once again. 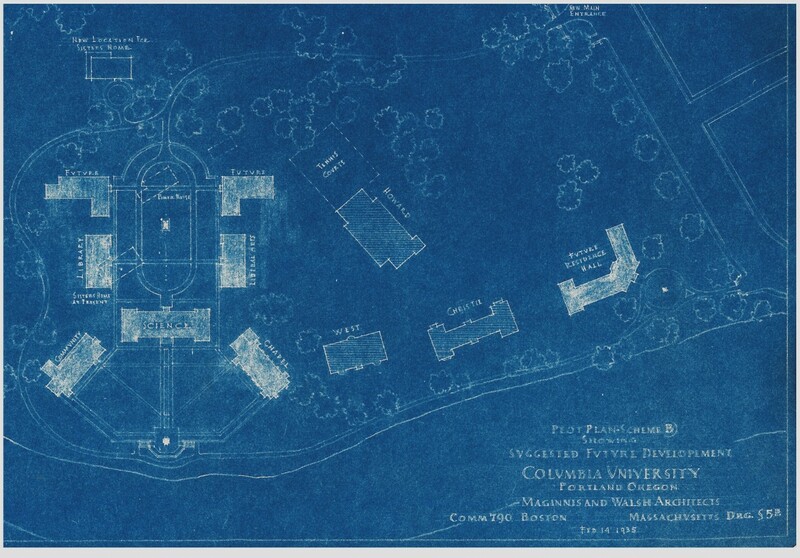 The visionary 1935 plan (blue, above) was discovered lurking within forgotten filing cabinets during the Howard Hall demolition. The track and field & football stadium facility has been lost from ’27-’37, but the tennis courts (included on this plan) have been a continuing campus feature ever since! Also notice, our Science building, Romanaggi Hall since 2010, wasn’t in fact dropped into the location where the blue-scheme wanted it to be. Passing another decade, the Engineering School is realized in brick and concrete in 1947. Happily the aerial records of the campus show that a dedicated track and a baseball diamond were de facto features of campus from the earliest days; there was never a need of ‘plans’ to ensure our students fielding and supporting athletic teams.